We’re detouring off Highway 11 for a bit, this time onto Highway 65. 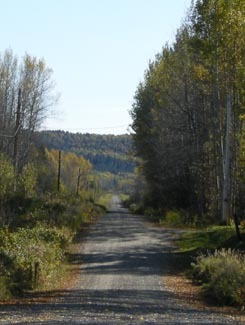 Kenabeek is a cluster of houses 20 kilometres west of Thornloe on Highway 65 in the Temiskaming Clay Belt. Kenabeek is very very small. There’s not much of a town, at least on the highway itself, although I assume that there are more houses and farms as you venture off onto the area’s dirt country roads. Kenabeek hosts its annual fall fair, the Kenabeek Fun Fair, the last weekend in August. I’ve been told that there is a small conservative Mennonite community, which farms in the Kenabeek area. In order to sustain the community, it has not been unheard of for young men and women to marry into the community, traveling from more established Mennonite centres such as Wellington County in Southern Ontario, and even from Pennsylvania. I’ve only visited Kenabeek once (in fall 2008), so maybe you can help fill me in on the community. Email me to add to this page at info (at) highway11 (dot) ca. 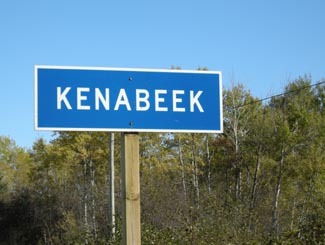 Oh, and if you can fill me in, how do you really pronounce Kenabeek? Every time it’s come up in coversation with me, I’ve heard (and used) “Ken-ah-beek.” On the Englehart and New Liskeard radio stations, I heard it pronounced “Ken-ah-beck.” If you know, let me know. This entry was posted in Temiskaming and tagged dot on the map, farm town by Highway11.ca Editor. Bookmark the permalink. We walked to school all winter below zero weather. This site certainly brings back memories. I’m sure there are skinners still living in the area. My sister was Sarah Alberta. Great site. Well, my grandfather (John Smith) lived at the top of the sand-hill just East of Kenabeek on 65, for most of his life. - as to “a group of houses” — not really, it was a town because the general store had a post-office. Everything else was a 160 or 80 acre farm with a farm house, a few perhaps with a house for a parent or a grown grown child. I think its about the smallest town I have ever run across. I wouldn’t miss going there for a few weeks in the summer nor would my 3 grown children. You know your s***! Saving this into bookmarks. Thanks! I’m hoping one of your expert gardeners can offer some advice. Any people tried these growlights? They look like they work well for dank nugs but I’ve never used CFL’s to grow with. Ken-a-beck, having lived there from 2 years of age to 24. Doug Mackenzie’s version of it. Don’t get me wrong, their show was really good, but they never lived there either. Hi, I see lots of wonderful comments about the community, it appears to be a great place. I was wondering if anyone could give me a little history of the fire department? I am trying to collect fire department histories from all over Ontario. Thank you so much for replying to my request. Unfortunately I wasn’t given any notice of the reply, hence the delay in responding. The information you have supplied is very much appreciated and gives a little more colour to the department. I will update my website with this data sometimes this week. My grandfather was a member of the volunteer fire department for many years. I remember often being told he was the “best man on the roof” when they were fighting a house fire. He worked with them from my grandparent’s early years in Kenabeek, until he was forced to “retire” due to age/safety issues. My grandparents (Mike and Lee Prisner) lived in the area, on one of the original 160 acre plots, from about 1980 until the early 2000′s. My uncle Kurt lived down the road from them. Ah Kenabeek!! (definitely Ken-a-beck) Four generations of my family have made that beautiful little community their home…my great grandparents (Eddie & Sarah Alberta), Faye & Bill Faulkner (my grandparents), Bill & Donna Faulkner (my parents) & my brother Kieth & I. Personally, I moved south for work opportunities but I miss that area greatly. When I was growing up, Lorne Ried owned the general store. My memories include – encounters with moose, bears, wolves & many other critters, blueberry picking, amazing fishing (compared to the sad offerings of these southern lakes), family gatherings (complete with guitar playing & bon fires) & chuckling at the southerners who showed up in June with snowmobiles asking “Where’s all the snow?”. Hahaha! The dog sledding mentioned above was/is offered by my cousins Ralph & Tammy Robertson, I believe. Now that I’ve stumbled upon this site, I feel a strong urge to return home for a visit. My grandmother was from McCool. She always told me it was near Kenabeek. Does anyone know know if McCool is a part of what we call Kenabeek today? I’ve never been able to get anymore info on McCool. Hi, can you tell me anything about the local general store in town that is for sale? We live in Northern Ontario and would like to get back into a small business like this. We owned one several years ago in Thunder Bay. Does it seem to be a viable business. As if there is a site for this little village. My grandparents, Peter and Lily Beneke farmed there since I was a young child. My brother Paul spent every summer up there helping them and hanging out with Aunts and Uncles, and the neighbors down the road. Me, I was not that venturesome. Was a little spooked by stories of the wildlife. And of course, little girls weren’t to ride on the tractor. Thank God for the Highway Book Shop in Cobalt where my poor Dad would sink oodles of money into books for me to read while we were visiting. Still, the people were and still are the most friendly, welcoming bunch. I have had occasion to hit the old schoolhouse for anniversaries and funeral luncheons. I remember fondly the Baxters who own the Kenabeek store. My Great Grandma Robertson and her daughter Ruth lived in the little green house beside the school house. It’s good to go back and visit. It’s like time has stood still. My wife and I have made Kenabeek our part time home for 6 weeks a year for the past 7 years on our 160-acre property with a cabin. We have fallen in love with the area and our hearts ache when we are not there. The remoteness of our cottage and the friendly people that live on our road have made it wonderful place to be. We visit the General Store / gas station / LCBO with post office now in an outside building beside the store several times a week for supplies. We got to know the previous and the new owners very well and found it a pleasure to hear the stories of the area. We have yet to see a moose on the property, only signs of their passing on the trails. Encounters with bear, lynx, porcupine, grouse, raccoon, ground hogs, wolf, beaver and many types of birds have shown themselves to use for our viewing pleasure. We hope to see moose when we make Kenabeek our permanent home in several years. I too am from Kenabeek. I know Don Byerlay. Hi Don. Haven\’t seen you since about 1985. Kenabeek is in fact pronounced: Kenuhbeck, or Kennabeck. It\’s very strange to see that someone who is not local would have a site about this remote place. I liked it so-so as a kid, but then I was glad to get out of there. It’s very hard to meet people in Kenabeek because there is no central point of contact. I,just ran across this brief blog on Kenabeek,interesting to see what outsiders can see from a small visit. I was raised here and still run my farm there.From your visit Kenabeek looks small , it actually covers a stretch of road far beyond and past the signage,6 maybe more townships,lining the highway,north and south. However you pronounce the spelling, people know where it is,it is actually on the map, and according to the history, the name was apointed by a railroad worker, which was reading the book of Hiawatha, during the building of the rail line in the early 1900,s.This comunity holds deep roots for many. It is pronounced Ken-a-beck! Born and raised there and having a reunion this summer, will write more to you when I can! i also have a friend from Kenabeek and it is definately pronounced “Ken-uh-beck”. I have a friend who is from Kenabeek, and I can assure you that it is pronounced “Ken-uh-beck”.